(1) Their were many pedestrians in the scene as,they seen firefighters struggling with the horrifying disaster and they couldn't do much only continue to stare as bodies continued to drop. (2) Firefighters arrived at the Triangle Shirt Waist Company Fire minutes after the alarm was sounded and they sprayed water at the burning building to put out the fire before it hit the top floors. While the workers were in a living hell with smoke and fire surrounding them and blocked exits. (3) This image shows when the fire was calming down with the work of the firefighters of course, and after the fire was put out, the investigators discovered the lack of fire safety in the building and how the Triangle fire was all started which would have been a cigarette or a match they are steal unsure of which one it is. (4) This was the fire escape ladder which was destroyed by the fire and the workers, the whole wieght of the workers and the fire underneath made the ladder collapsed which lead to severe circumstances. (5) Drop Drop thats the sound everyone in the scene heard,body after body the cause was the fire because of lack of fire safety the workers decided to jump off instead of burning in flames. (6) Max Blanck and Isaac Harris, owners of the large Triangle Shirtwaist factory were known as the "Shirtwaist Kings." But are they the ones to blame for this horrible disaster,There the ones that refused fire safety told from their insurance. There was no fire sprinkler,fire extinguisher and etc.. So this are the ones to blame for lack of safety in their buildings and if there was safety some life's would've been saved or maybe all of them,but this tragedy opened the eyes of many. Natural disasters are not always negative; sometimes they open the eyes of many people. The Triangle Shirtwaist Company Fire was a terrible tragedy, if it wasn't for that fire, fire safety laws would've been the same. Fire safety laws were not followed during the 1911's, and with that cause a huge tragedy has happened The Triangle Shirtwaist Company Fire, which killed 146 undocumented workers and most were women and some were under age. As progressives fought for many things such as fire protection and other issues that society had, progressives were like activist. There was lack of safety in the building; if they practiced fire drills there would've been less victims, in the underhand that organized labor movement, which open the eyes of many. The fire killed at least 146 workers out of 500 young women they were mostly Jewish and Italian immigrants in there 20's and some were younger, they had no way out just trapped in the building, some had no choice they had to stay and burn in the flames or jump off from the 9th floor, flames were gathered in the 8th floor to the 10th floor but the most damage was in the 9th floor, the tragedy was uncontrollable, girls jumping off the building because the fire department ladders did not reach to the 8th floor. There were many witness gathered around the building watching this tragedy happening, this was the worst tragedy that happened in New York's history before 9/11 attack of course, this fire was uncontrollable in less than 15 minutes it had killed those women all because of lack of fire preparation. But before the fire took action, in April, 1902 the company collected $19,102 for a fire with cause unknown. That same month it collected $12,905 in insurance with cause unknown, but a few years later the younger company named Diamond Waist owned by the Triangle Company yielded $17,000 in insurance, back then they thought fire insurance was a good idea but fire prevention was not. One was cheaper than the other it seemed to them," At a congressional hearing investigating a mine disaster, the coal operator was asked why he had not installed props to keep the ceiling in the mine from collapsing, to which question, he replied. "Wops are cheaper than props" meaning that it was not necessary to install any equipment, such as fire sprinklers, smoke detectors etc… that was a major issue. We all know that this might have cost a lot of money and like in every tragedy someone has to donate money or assist in any way. The mayor donated $100 which would be a couple of thousand dollars today, and others donated "children gave and big shots gave" Andrew an wealthy guy gave 5,000 which today is 20,000.This helped but money can't replace the life's of those love ones, they said life's are being lost"50,000 workers were losing their lives every year in industrial accidents- thousand a week" many still remember this day. For many it was a new sound such as shepherd "I learned a new sound a more horrible sound than description can picture. It was thud of a speeding, living body on a stone sidewalk" (shepherd) the fire department ladders did not reach all the way to the 8th floor and lady's were leaping to the ladders then they hit the concrete, they tried another solution the blankets but to many women tried to jump in the same blanket. Like many of their fellow immigrants in other factories throughout the city, the Triangle Shirtwaist workers labored from 7 in the morning until 8 at night with one half-hour break for lunch. They spent their time hunched over heavy, dangerous sewing machines that were operated by foot pedals. The rooms in which they worked were dirty, dim, and poorly ventilated. The finished shirtwaists hung on lines above the workers' heads and bundles of material, trimmings, and scraps of fabric were piled high in the cramped aisles between the machines. Most of the doors were locked on the theory that locked doors prevented the workers from stealing material. Labor advocates were outraged that inadequate workplace and fire safety rules had allowed such a hazard, especially since Triangle workers had struck 16 months earlier demanding better pay and work rules. Investigations found: The Triangle workers had never participated in a fire drill. The Asch building in which the Triangle facility was located, had no sprinkler system. Fabric was strewn throughout the factory. An open bucket of oil was on the floor for lubricating sewing machines. Oily wooden floors spread the fire quickly. Boxes blocked the exits there was no third staircase as required by New York City's building code. Stairwell doors opened inward rather than outward. Sewing machines were placed so closely together that there was little room to move among them "The death toll is astonishing and the horror of watching these people die that way just shocked the City," said Michael Hirsch, co-producer of the HBO documentary, "Triangle: Remembering The Fire." So as you heard the floors were cornered with oil and that made the fire spread faster with that and with the sewing machines that was a major issue. The cause would have been a cigarette or a match they are steal unsure of what it is. This fire made laws take action such as fire safety laws, "The tragedy reminded people of the need for higher safety standards in factories and the need to protect workers from unscrupulous employers "but who to blame, many were accusing everyone like in the Salem witch trials. Many people were outraged at the tragedy. The Triangle Shirtwaist Fire helped to "solidify support for workers' unions like the International Ladies' Garment Workers' Union". The owners, Isaac Harris and Max Blanck, were tried for manslaughter but were accused in 1914. Though most people were sick in tired of lies. Today there are many laws that govern the condition of workplaces. Among those regulations are implemented to let people out during a fire. Multiple fire exits, unblocked fire doors, and clear pathways to exits are all required. Firefighting equipment must be maintained in the building. Fire sprinklers for higher floors and portable fire extinguishers. Education for employees is a must. All employees are to be trained on the proper use of a fire extinguisher as well as escape routes and fire drills. Emergency evacuation plans are also required in writing and posted. Written fire prevention plans must also be available. "All areas that are fire hazards or that contain equipment of chemicals that could start fires must be maintained and controlled and all times. The United States Department of Labor classified this set of standards as the Occupational Safety and Health Administration (OSHA) standards" after the fire most people opened there eye and fought for there life's in order to be safe they said but know every employee makes sure that the building there in is safe all because of this incident everything has changed in America there more aware of attacks and natural disasters and they seemed prepared in some occasions. The Triangle Shirtwaist Company Fire was a terrible tragedy, if it wasn't for that fire, fire safety laws would've been the same. Fire safety laws were not followed during the 1911's, but not as worst as 9/11 but that would be an other devastating story or reality which most still remember tragedies are like scars. 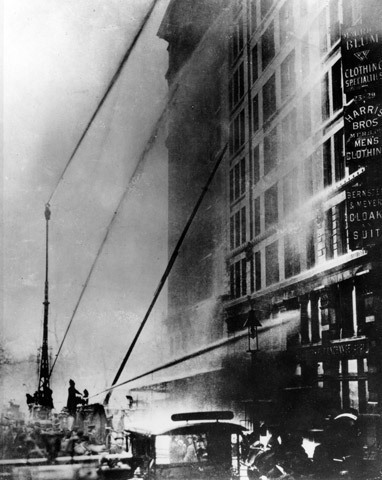 "Uncovering the History of the Triangle Shirtwaist Fire", David Von Drehele , August 2006. I like the information you presented but the pictures need some captions for a better understanding. I'm working on that, just need to observe the images well and write my perspective. Seems interesting but I agree with Miguel Molina you need to add captions,but other than that good job, what a horrifying disaster. I have finished writing all the captions for the images above, check them out if you like.